UWS, a leading manufacturer and designer of USA-made storage carriers and truck accessories, celebrated July 4th with nearly 40 years of American manufacturing. UWS has been manufacturing quality truck tool boxes and storage chests in the United States since 1981. Over the years, its product line has expanded, its customers have grown and it joined the CURT Group family of brands. The company is excited for what the future holds, and one thing it is committed to is quality American manufacturing. 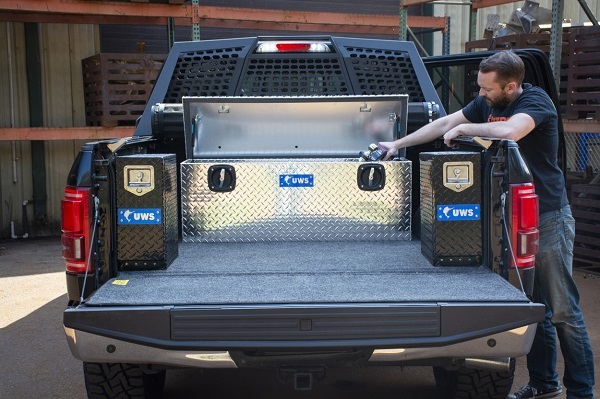 Some of the newest products UWS released this year include a low-profile version of our truck side tool box and a Secure Lock under tonneau chest box. The low-profile side box is designed to match its low-profile crossover tool boxes and features a patented RigidCore foam-filled lid and extra-thick aluminum construction. The Secure Lock under tonneau tool box measures 16-1/2 in. tall to be compatible with most truck bed tonneau covers. It has dual-locking twist handles for maximum security and convenience, and it also comes with a RigidCore lid and extra-thick aluminum build. Both of these new products are, of course, made right here in the USA at the company’s manufacturing facility in Perry, Fla.
Want to keep talkin’ trucks? Click here!